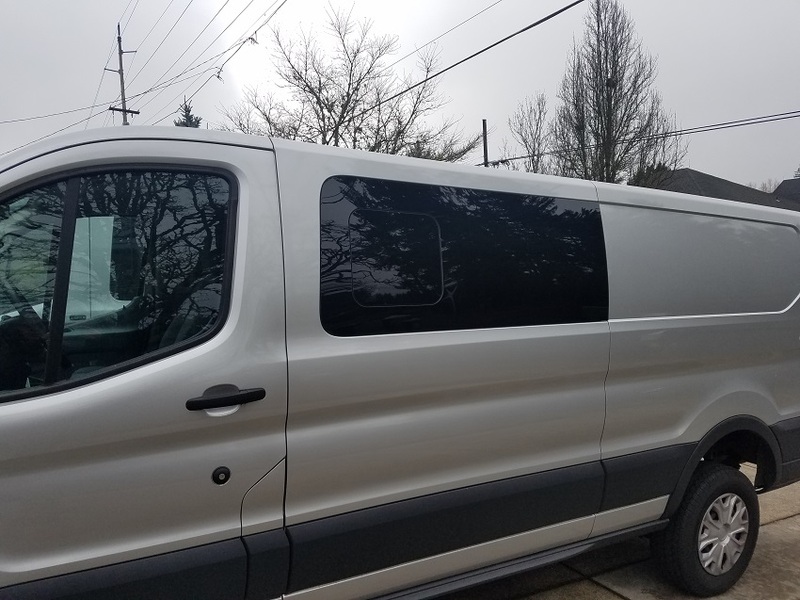 One of the first things I wished for when ordering our Transit was that Ford would have offered a 'crew van' window configuration. A window just behind the driver and one behind the passenger but no windows in the back half of the body. You can get a cargo van with door glass on the passenger side but no luck for the driver side. 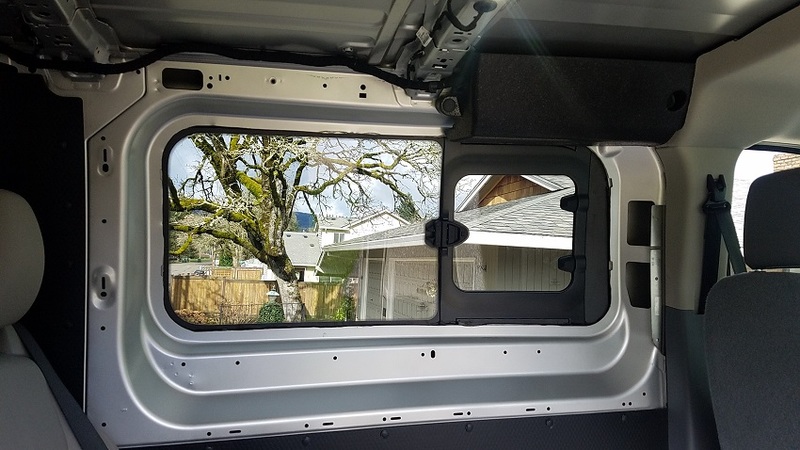 I looked at the Transit body carefully and it seemed to me that the factory glass would fit on a cargo van if you just cut along the opening of the inner panel. 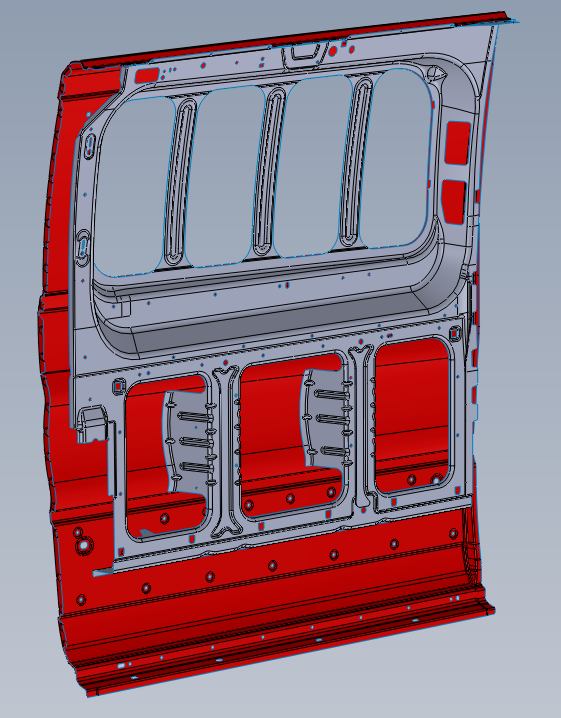 Once I got the CAD models for the body sides, I confirmed that the outer panels were the same shape between the passenger (window) vans and the cargo (no window) vans. Same depth of recess and same body lines...unlike the E-series where cargo and passenger vans are way different. The Transit cargo van inner structure mated to the passenger outer skin in CAD confirmed for me that this might just work! A customer of mine with a low roof Transit was willing to give it a try before a big family trip to ID and the result turned out great! We opted for the factory flip out glass panel but the same applies for the full glass panel too. Goes in using common methods for bonded window installations. Big shout out to forum member JWA for a few recommendations and install tips. Always great to speak to other members and learn a few things from them. Slick! Well done as always. Well props to you and the van owner for taking the big leap. It's always nerve racking to cut sheet metal, but being the test case has to be incredibly stressful. So did you use the passenger side glass on the driver side (symmetrical glass), or does the glass come from the passenger version? It is the glass for a passenger van. Driver side. Great looking work MG----I expected no less truth be told. Even though refitting is possible anyone ordering a brand new Transit should carefully consider having the factory glass option as it would far less expensive. Then again if only certain panels are needed/wanted this flexibility is nothing but great news for all full size Transit owners/buyers. Very cool. It would be nice to see a factory crew van option like Sprinter offers, though. In Europe vans tend to be more multi-purpose, so they are better at usability options. Years ago (2004) I spent a few weeks driving a Sprinter crew van around France as a part of a bike tour group following the Tour de France. It had a really cool second row seat setup: a two person bench seat with integrated partition separating seating from cargo area. What was clever, though, was that the entire seat setup was hinged in a way that it could cantilever forward and change from a seating setup to a bulkhead behind the front seats, giving you full cargo capacity. Wish I had a photo of it. Mg’s Solution for the low/regular roof Transit is awesome. Looks great! There are no factory-look aftermarket solutions I can find. There are solutions for the medium and high top Transits that use a much taller window. Yeah, that was the issue with the low roof. No aftermarket windows to fit the space like the medium and high roof have. It was important to the customer to have the factory look. Another solution from a true pioneer. Nice work, MG!